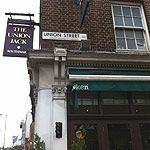 Flying the flag as a solid pub rather than a trendy gastropub, The Union Jack screens all major sports' matches and is ideal for a no frills drink. Do you work at The Union Jack? What did you think of The Union Jack? Since the new management took over this pub has just got better and better, Cleaner, repainted, bathrooms spruced up and the interior is much more female friendly. Lots of really cool artwork on all the walls makes you feel like you are in a really cozy art gallery and lots of candles give a really warm atmosphere. Lots of really comfy sofas and coffee tables. The sunday roast is huge and well made. Nice and simple. I really look forward to spending lots of time there and will love to see how it shapes up over the summer with the big doors and windows wide open. With Gordan Ramsey's new restraurant right across the street this is a cheaper option for a meal. Great pub, great food and reasonably priced drinks. Perfect pool table, two quiz machines and fruit machines. This pub has a large screen and shows all the big football games. Its recently been refurbished with polished wooden floor & bar, an open front for the summer, external canopies, and a cool colour scheme within. This pub allows smoking throughout, but has a good air conditioning system so its not your usual smokey pub. The bar staff are friendly and some are rather attractive too. On some Friday nights they have a karaoke, which happens to be a right laugh, and some Fridays they have the usual cheesy disco which always turns out to be a good night too. 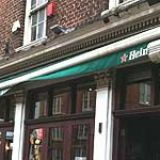 Its the kind of pub you can comfortably go in for a night out with a group of friends, with your partner for a relaxed evening meal or on your own for a beer when you just want to get away from it all. All in all, its a great pub. Well worth a visit!